Exclusive style and the perfect way to display your favourite plants. Perfect for a number of different plants, shrubs and trees. The white-washed stone effect creates a completely unique display. Large in size, it can used for larger plants like standard trees and shrubs and in particular instant impact items like bay trees, olives, cordyline or phoenix palms. Supplied as a single 37cm diameter pot, made from heavy-duty injection moulded polypropylene, frost & UV resistant. 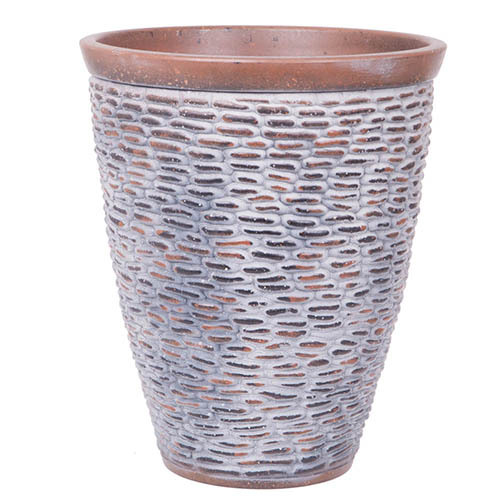 Perfect for a number of different plants, shrubs and trees, this unique stone effect planter with a large 37cm diameter will add a rustic, decorative look to your home or garden, without the cost of real pottery or terracotta. The white-washed stone effect creates a completely unique display and large in size, it can used for larger plants like standard trees and shrubs and in particular instant-impact items like bay trees, olives, cordyline or phoenix palms. Ideal for containing larger growing plants and varieties, keeping them the perfect size for the patio while retaining maximum impact. Supplied as 37cm (14.5in) Diameter, 46cm (18in) Height.